European online retailer CentralPoint has listed the Intel Core i9-9900K and the Core i7-9700K for pre-order. CentralPoint expects the stocks to arrive as early as September 7 and has listed the i9-9900K for €689 + VAT and the i7-9700K for €539 + VAT. Given that we will not know the MSRP of these chips before September, the listed prices are to be taken with a grain of salt. 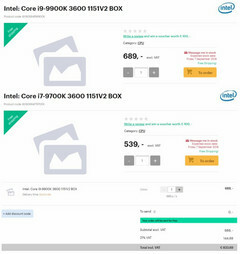 Intel is still a few months away from launching the 8th generation 'Coffee Lake-S Refresh' CPUs such as the Core i9-9900K and the Core i7-9700K but CentralPoint, a European online retailer, has already put up listings for both these CPUs and is ready to take pre-orders. CentralPoint is expecting to stock the CPU on September 7, which is too good to be true. A more shocking fact is that the retailer has listed the prices even before Intel made them official. The listed price of the Core i9-9900K is €689 excluding VAT. That is just unbelievable considering that the current Intel mainstream desktop flagship CPU, the Core i7-8700K, retails from €329.99 in Europe. Granted that the Core i9-9900K features 8 cores 16 threads and can push 5 GHz turbo out of the box but the price difference simply appears too large to warrant a pre-order at this stage — especially, when Intel itself hasn't made these CPUs official yet. The Core i7-9700K also gets a listing at €539 + VAT, which still is a lot more than the Core i7-8700K. The Core i7 in the upcoming 'Coffee Lake-S Refresh' lineup will not feature Hyperthreading. We will get to know if that really makes a difference in gaming and other tasks once we get to review the CPUs post launch. In any case, we advise readers to take those prices with a grain of the proverbial salt. Logically, it doesn't make sense that these prices would be real. This seems to be more of a cash-grab by online stores to increase pre-orders. Think of it for a second. If Intel is to come anywhere close to AMD in the price-to-performance parameter — which it really needs to do — there is no way that it can price an 8-core CPU more than the combined price of an AMD Ryzen 7 2700X and a high-end X470 motherboard, that too for what is basically the same 14nm+ architecture as the current 'Coffee Lake-S' CPUs. Either that, or Intel is planning to do something special with these chips. For now though, we'll lean towards the improbable and suggest you do the same as well.